A few weeks ago we created a basic how-to guide on sweating a copper plumbing fitting. 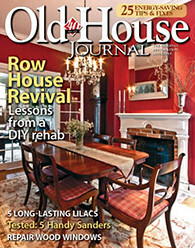 Though this aspect of home improvement is often intimidating (it was for me the first time I did it), it's a completely doable task if you have the right tools for the job and the know how. However, I have to say that I only really started to feel completely comfortable when I picked up one critical item for my plumbing toolbox, my self igniting and hose fed torch. 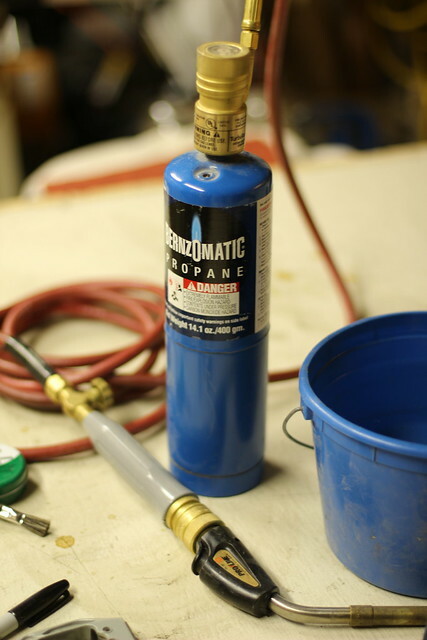 When I first started soldering with a propane torch I was using the old standby of a flint strike and a torch affixed to the top of a propane canister. 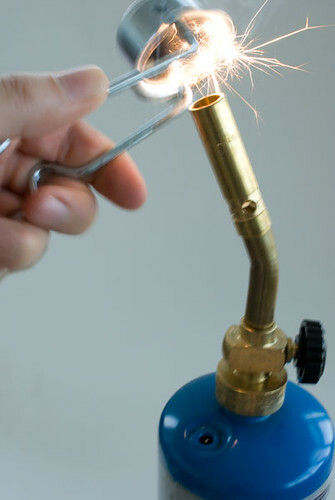 To light, you turn on the gas at the torch's knob, then strike the starter to create a spark. The spark then ignites the gas and gives you a flame that you may adjust. Once lit, you can then adjust the flame to the desired level and then begin working on your soldering task. Not a horrible process, but a bit cumbersome, especially if you're working on soldering something that is upside down. When you invert the torch to get a better angle on the fitting, the propane heads to the top of the canister and your flame grows larger than you intended. This is not desirable, since you want a consistent flame and temperature, and can also be quite dangerous when working in a wall or confined space. After a few years of working on plumbing using this old standby torch, I figured there had to be a better way to go about the task. I started a little online research for an improved product and discovered just the thing for me. 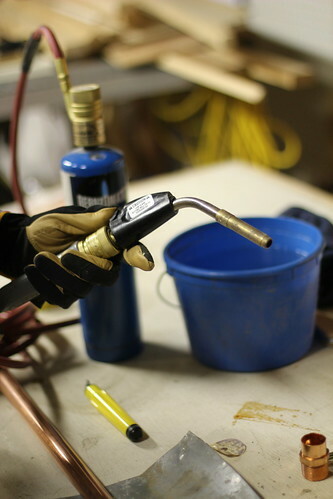 The TurboTorch is an Acetylene bottle mount gas control valve connected by a supply hose to a self ignition hand held swivel torch head with an adjustable flame. This perfect product (for my needs) solves all of the problems I was having with the bottle mount and manual ignition torches and sets my mind at ease, even if it was a bit of a luxury in the realm of tool purchases. The setup consists of a regulator that attaches to a standard sized propane or MAPP gas canister than you can pick up at pretty much any home improvement store. The regulator has a large knob on the top that you turn to enable gas to run into the hose connected to the regulator. The host is a roughly 10 foot long flexible connection that allows you to work at a distance from the canister and at about any angle. I no longer need to worry about where to set the canister when not in use, nor do I need to worry about the flame's intensity increasing or decreasing when working in an inverted manner. The only thing I need to worry about now is the fitting I'm soldering or occasionally tripping over the hose if I get it tangled around my feet (hey, I won't say it hasn't happened). The final component to the device is the torch head. Attached to the opposite end of the hose, the torch head solves the remainder of my difficult soldering dilemmas. 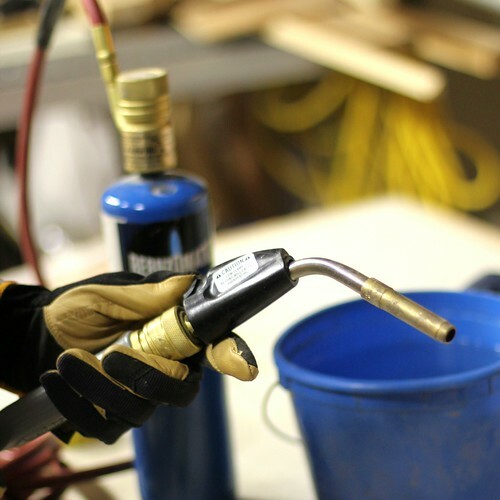 The handle is a fairly ergonomic shape and includes a self ignition thumb button on the top of the device as well as a gas control valve on the base of the torch. It's also a swivel head so I can easily maneuver it to the right angle to accomplish the job. Once the gas is turned on at the canister and flowing through the hose to the torch head, you turn on the valve at the torch and can hear the telltale hiss. At that point a simple click of the thumb button and you've got yourself a beautiful blue flame. 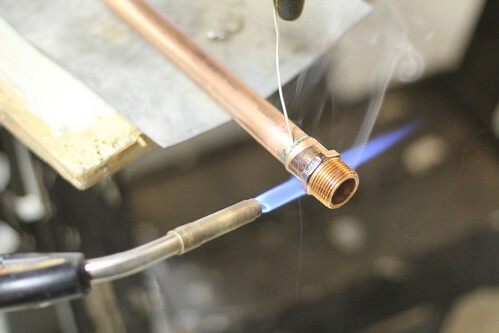 All that's left is to adjust the valve to reduce the flame to a low and controlled point, then you're ready to solder. The only thing I wish this tool included was the ability to kill the flame and gas feed without shutting off the torch valve, and reignite without needing to adjust the flow rate again. I guess I'm looking for more of an on/off switch rather than the adjustable control wheel valve. Since my original purchase of this tool roughly seven years ago, several other manufacturers have developed similar style tools. They all do very similar things and seem to perform roughly the same tasks. Though the model I purchased isn't the cheapest on the market especially now, I'm more than happy with the brand, quality, and functionality. I've yet to have an issue with its function and have used and abused it on a regular basis throughout the years. If you're in the market for a tool like this, I can highly recommend the model we own (linked above). If the price is too steep, here are a few other contenders that I found while doing a more recent search. I can't speak to their individual performance or quality, but they seem well suited for the job. Do you own anything similar? If so, what brand/model? Have you run into any of the difficulties I've mentioned when working with copper pipe fittings? Is it an intimidating prospect to solder in your own home? Let us know what you think, I'd love your take on the matter. Thanks for this Alex! I may pick one up soon.